Diabetes can lead to a whole host of health problems, but did you know that it can also put you at risk for dental issues? The implications of high blood sugar extend to every part of the body — including teeth and gums. 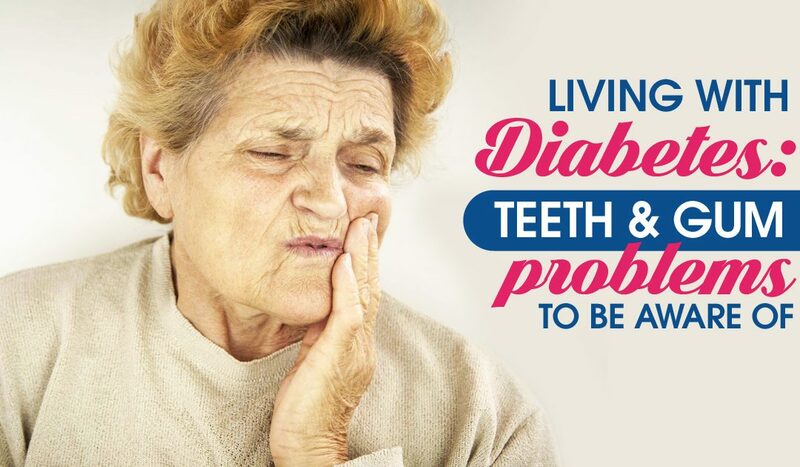 When it comes to diabetes, teeth and gum problems are something you need to be aware of. Here are few of the ways diabetes can wreak havoc on your mouth, and how you can prevent this damage from occurring if you are one of the 21.9 million people in the U.S. who suffer from diabetes. Diabetes can reduce the blood supply to the gums, which increases the risk for gum disease. This risk is amplified if you had poor dental health prior to being diagnosed with diabetes. Gum disease takes two forms: gingivitis and periodontitis. Gingivitis is less serious, but can develop into periodontitis if left untreated. In addition to cutting off blood to the gums, diabetes reduces the body’s resistance to infection, putting the gums at risk for gingivitis, an inflammation caused by the bacteria in the form of plaque. The longer plaque remains on your teeth, the more it irritates the gingiva — the part of your gums around the base of your teeth. The risks for diabetes make good dental hygiene non-negotiable. Dental care and diabetes care must be practiced in tandem to effectively combat issues like gum disease and dry mouth. 1. Brush your teeth at least twice per day and floss once per day. This will help keep plaque buildup at bay and remove food particles that can lead to tooth decay. Consider an electric toothbrush for the best brushing results. 2. Manage your diet. Avoiding foods that are high in sugar will help control your diabetes and your oral health. 4. Schedule regular dental visits. Consider going beyond the minimum recommended two visits per year so your dentist can monitor progress and watch for new developments in your mouth related to diabetes. 1st Family Dental offers specialized treatments for gum disease and other issues related to diabetes.Contact us today to learn more about how to get on the road to good dental health while managing your diabetes.